Bill Barnett on Strategy: Delete All Meetings! You don't need me to tell you that scheduled meetings are over the top. A friend of mine at a high tech firm here in the Valley noted that this week his entire schedule - all day every day - was nothing but meetings. We're no better here in academia. We run life through committees, which of course meet. We even have a committee called "The Committee on Committees." Of course we understand the theory. 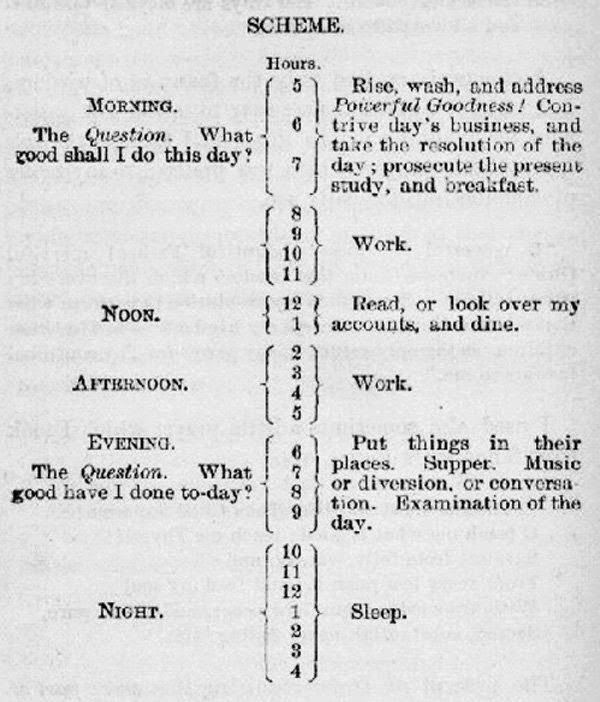 Some say it goes back to Ben Franklin, who famously advocated planning as a way to become more virtuous. You're thinking "I must be a saint." 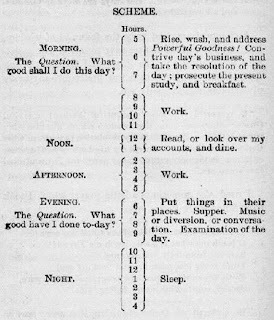 But note, in this sample of Franklin's idea of a well planned day, that there is not a single meeting! Well, perhaps some of his 8 hours of "work" included meetings. But odds are, those meetings would have happened on an as-needed basis. They were not formally locked into his schedule - and certainly not put there by others regardless of the reason (or lack of reason) as is common for us all today. Meetings are a great example of what sociologist Max Weber called "procedural rationality" - as opposed to substantive rationality. Meetings symbolize that work is being done in a rational way, regardless of whether they actually contribute to getting things done. "I did not see you at the meeting." "Did you know about the meeting?" "We should work on this. Let's schedule a meeting." "I'm heading up a new committee. We'll be meeting." And then there are all the regularly scheduled meetings set on "repeat" within everyone's calendars. What is missing from formal meetings is the question "why?" Under norms for procedural rationality, we assume that meetings make sense. But think of how often you meet without actually knowing why! We set a meeting, and then we figure out what should be on the agenda. In this way, meetings are a perfect example of a solution looking for a problem. On the other hand, there is a type of meeting that is really very useful - the informal chat. I remember an eye-opening conversation with the great anthropologist Bill Durham. We talked spontaneously about "co-evolution" and I came up with an idea that would lead to a series of papers and a book. You probably have similar experiences; the informal, possibly random interaction that turned out to be golden. Informal conversations are useful because unless they have value you don't have them. We cut small talk short precisely because it is not useful. Informal talks continue only when they matter. Knowing this, Steve Jobs' vision for the new Apple campus is of a great big circle. His idea was to increase the chances of random, informal interactions in the center. No doubt Steve still remembered the informal "random access" period at the Homebrew Computer Club back in the 1970s, where he and Wozniak showed off their first Apple computers. The lesson? Delete all meetings from your calendar. Schedule time to actually work. And meet with others informally just as long as is useful. An interesting study of the value of informal connections is by Sharique Hasan.